The Slack integration allows you to post a message to a Slack board every time a blitzen form or survey is submitted. Note, to use this integration you first need to have a Slack account. Navigate to the ‘Integrations’ section in the left-side panel and click on the ‘Slack’ app. Choose a form or survey to work from (How to Choose an Input). 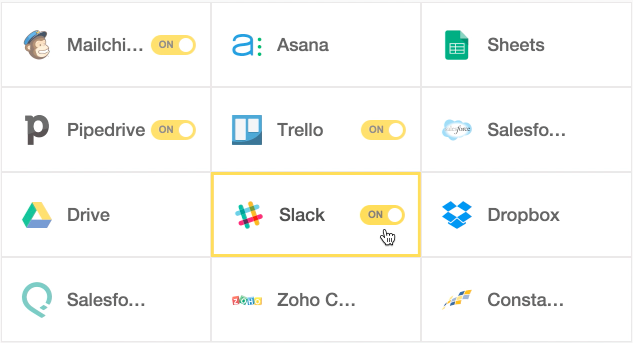 Drag the Slack App over into your workflow as an output. Configure the app by clicking the ‘+’ icon. First you will see filter options. You will then be asked to choose the destination channel your submissions will be sent to. First you must decide whose credentials to use, then you will choose the channel posts will be sent to. If you do not see the correct Slack channel in the dropdown, it is possible that your channel is set to ‘private’. Blitzen can only reach public channels. Finally you can use the mapping tool to specify the information you wish to be sent to the Slack channel. In our example we add a friendly reminder in text form.